Jessica Koslow has earned a cult following for Sqirl, her tiny Silver Lake restaurant where people line up for Kokuho Rose brown-rice bowls with sorrel pesto, and burnt brioche toast with housemade jam and ricotta. 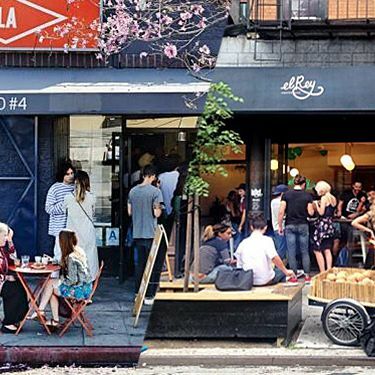 Now, for the first time ever, she’s bringing her skills to New York — specifically, at Cheap Eats favorite El Rey Coffee Bar & Luncheonette on the Lower East Side. Koslow, El Rey owner Nicholas Morgenstern, and chef Gerardo Gonzalez have collaborated on a dinner menu, which they’ll serve on Tuesday, January 20 and Wednesday, January 21. There will be three seatings each night — at 6, 8, and 10 p.m. — and the meals will begin at El Rey and end with a walk (ideally, in the snow!) to Morgenstern’s Finest Ice Cream for dessert. For those who cannot make it to the dinners — or are just obsessed with Sqirl — El Rey will offer some of Koslow’s specials on its à la carte lunch menu throughout the week of the January 19. And over at Morgenstern’s, there will be two special flavors available from January 19 to 31, featuring Koslow’s signature jams: sorrel ice cream with seascape-strawberry-and-rose-geranium jam, and pistachio-and-fennel sorbet with moro-blood-orange jam. That’s not all: This event is the first of two collaboration dinners between El Rey and Sqirl — this spring, the El Rey team will travel to L.A. to cook a dinner over there. Consider this the beginning of a beautiful, veggie-centric friendship. Reservations for dinners can be made right here, right now.